There was an avalanche of goals in Couva last night as defending Pro League champions Defence Force and current League leaders DIRECTV W Connection both motored into the 2013 Toyota Classic semifinal stage with emphatic wins over Central FC and Malabar FC respectively. 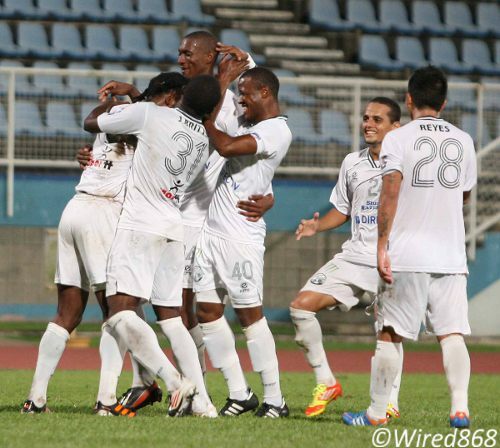 Malabar had recovered from a 3-1 deficit to stun San Juan Jabloteh 4-3 in the opening round. But the Super League outfit found Connection to be a different matter entirely. An 11 minute goal burst, courtesy of a Joao Ananais penalty and a Jerrel Britto double, put Connection three goals clear after just 19 minutes. 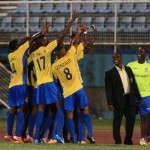 Photo: DIRECTV W Connection players celebrate during their 4-1 Toyota Classic win over Malabar FC at the Ato Boldon Stadium. And, although Kevon Woodley offered Malabar a lifeline with a fine finish in the 65th minute, the lower league team never look capable of a second miraculous escape. And captain Gerard Williams wrapped up the affair with a wonderful strike on the turn from outside the area in the 74th minute. Just like in the opening round, when Silvio Spann picked up a second yellow card for diving, Connection again found a way to unnecessarily complicate the night’s work as defender Mekeil Williams received a straight red card in the 90th minute for cursing the assistant referee. 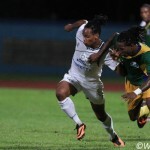 Williams will be unavailable for Connection’s next Toyota Classic fixture against either Point Fortin Civic or Guaya United next week. It was all good news for Defence Force coach Ross Russell, though, as the army/coast guard combination avenged successive defeats to Central with a mauling in Couva. 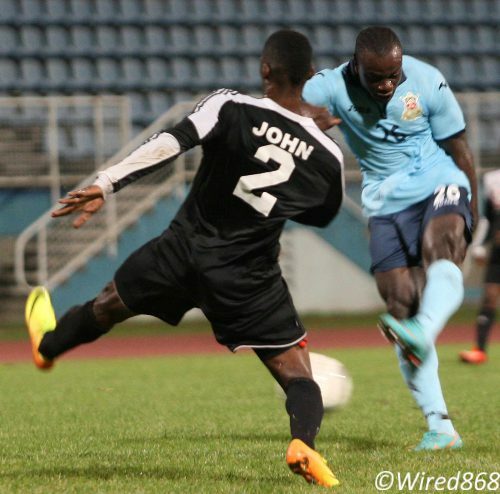 The “Couva Sharks” were without goalkeeper Jan-Michael Williams and Rundell Winchester who are both on international duty with the “Soca Warriors” along with Defence Force utility player Curtis Gonzales. But where was the Central defence? Photo: Defence Force striker Richard Roy (right) gets a shot past Central FC defender Elton John during his team’s 5-1 Toyota Classic win. Nineteen year old custodian Javon Sample had a memorable debut in the Toyota Classic last night as he conceded five but stopped at least as many as Defence Force put Central to the sword. 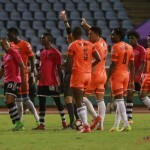 A loose pass from the Central defence was diverted from Josimar Belgrave into the path of Richard Roy and the former Trinidad and Tobago striker put the soldiers ahead with a firm effort that Sample could not keep out in the ninth minute. It would be over an hour before Defence Force would score again and it was not down to a lack of opportunity. On three occasions, Sample denied stand-in Defence Force captain Kevon Carter in one-on-one situations while there were two saves from Richard Roy and Josimar Belgrave each as well as fine blocks to deny Jemel Sebro and substitute Devorn Jorsling as the former St Anthony’s College goalkeeper almost single-handedly kept Central in the game. Central fans might have begun to dream too as the Sharks mustered a fortunate equaliser in the 60th minute. Inexplicably, Ross Russell Jr, the coach’s son, allowed a deep Jason Marcano cross to drop behind him and substitute Keon Trim was on spot to tap home an unlikely equaliser. 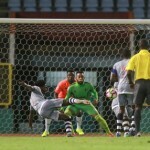 Central could have even taken the lead in the 62nd minute when new captain Marvin Oliver rose to meet a cross from the former team leader, Marcano, but placed his header into the side netting. After another flurry of Sample saves, Defence Force reclaimed the lead in the 73rd minute as Jorsling used his right foot to volley home a precise right side Sebro cross. Photo: Central FC goalkeeper Javon Sample (left) pulls off a remarkable double save from Defence Force attacker Josimar Belgrave. 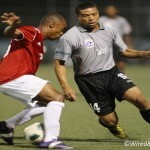 Sample was the busiest player on the night as Central crumbled to a 5-1 Toyota Classic defeat. Central might have equalised again in the 79th minute as Trim spurned a golden opportunity at the far post following a right side Marcano cross. But, when Defence Force scored again, the dam finally cracked. Jorsling slipped through the Central defence for Carter whose shot squirmed under Sample to put the “Teteron Boys” 3-1 ahead in the 82nd minute. Four minutes later, Carter returned the favour and Jorsling blasted high into the top left hand corner from the edge of the penalty area. And Carter made it 5-1 at the stroke of regulation time as he stepped inside and then outside substitute defender Omar Charles before drilling past Sample from inside the 18-yard box with his left boot. 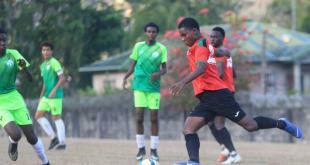 Defence Force is unlikely to have things so easy next week against Club Sando. Defence Force (4-1-4-1): 1.Kevin Graham (GK); 13.Marvin Jones, 5.Devin Jordan, 6.Rodell Elcock, 17.Ross Russel Jr; 4.Dave Long, 15.Jerwyn Balthazar; 12.Jemel Sebro (23.Kerry Joseph 88), 10.Josimar Belgrave (9.Devorn Jorsling 62), 11.Kevon Carter (captain); 26.Richard Roy (80.Adrian Welch 87). Unused substitutes: 25.Sheldon Clarke (GK), 3.Keston Williams, 14.Cory Rivers, 18.Sean Narcis. Central FC (4-1-4-1): 25.Javon Sample (GK); 2.Elton John, 19.Dwight Pope (4.Omar Charles 46), 12.Jamal Jack, 3.Keion Goodridge; 6.Toric Robinson (13.Johan Peltier 55); 7.Jason Marcano, 10.Marvin Oliver (captain), 23.Hector Sam (22.Keon Trim 55), 11.Darren Mitchell; 9.Dwight Quintero. Unused substitutes: 8.Shem Alexander, 15.Kaydion Gabriel, 16.Akil De Freitas, 18.Kevon Goddard.